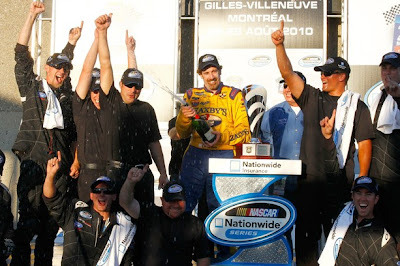 Boris Said Wins NASCAR'S NAPA Auto Parts 200 at Montreal! 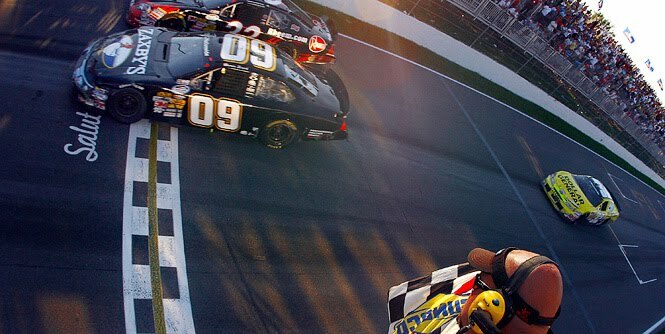 What does NASCAR racing have to do with turfgrass at The Farms CC? Some of the maintenance staff are big big fans! More importantly, huge Boris Said fans! 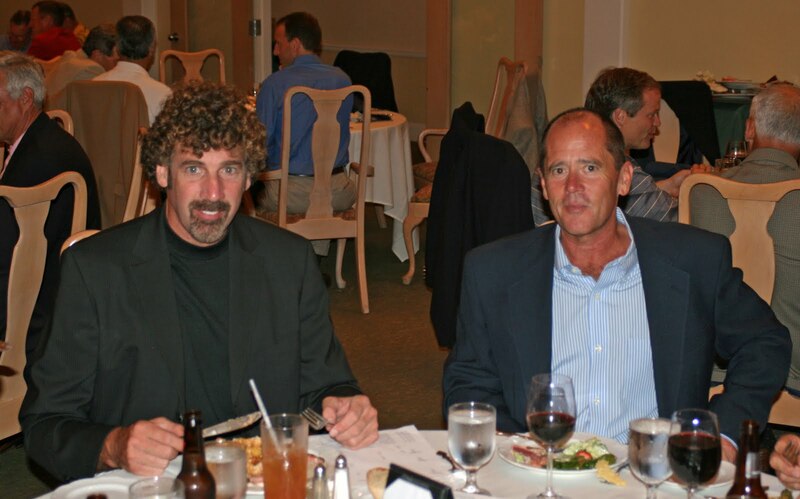 Couple that with the fact that Boris is a longtime friend and frequent guest of member Mike Vallone and you can understand my compelling desire to post this entry. Along with his tremendous racing skills, this "road-track" specialist is also a very passionate golf fan. 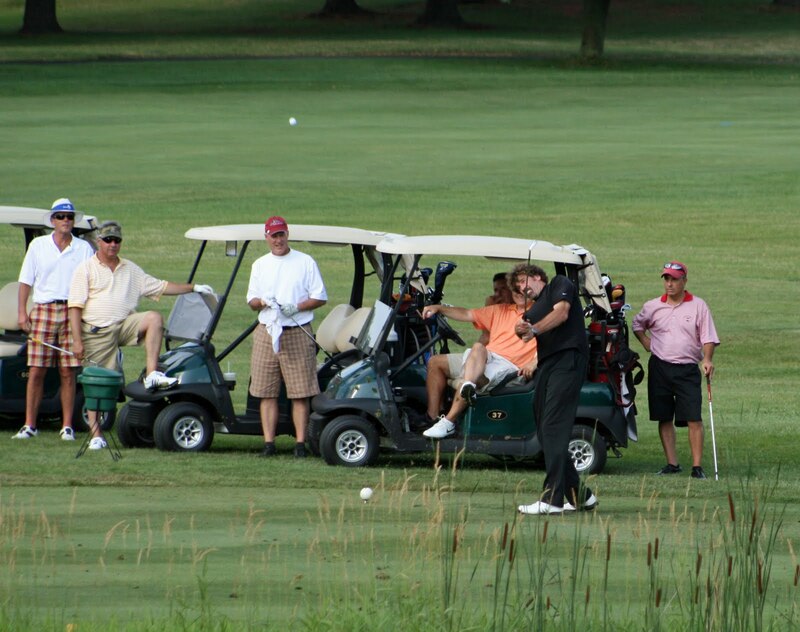 He has a single digit handicap and has forged some notable friendships in the world of golf. Names like Mark O'Meara, Stuart Appleby and John Cook come to mind. During our 2008 Men's 3 Day Member Guest's Par 3 tournament, Boris carded a hole-in-one on #9. An incredible feat since the tees were in the thick rough on the top of the hill on the right. The downhill shot was to a treacherous front left pin. 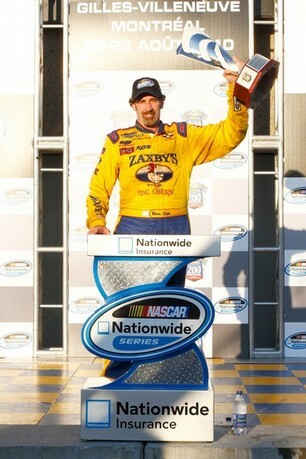 The maintenance staff congratulates Boris Said for landing his first NASCAR Nationwide victory! In a photo finish, Said passes Max Papis on the inside of the last corner. He then beats him in a drag race to the finish line. It is not to be missed! 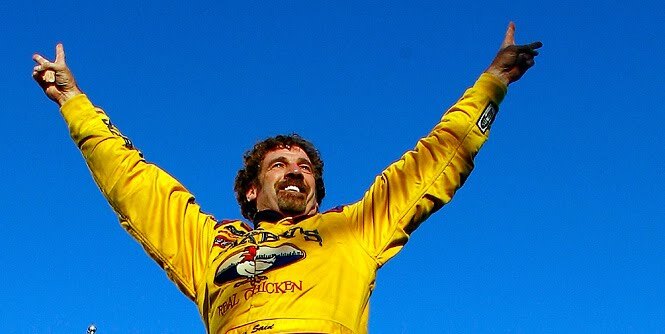 The following video and photos are from NASCAR.com. This season will certainly go down in the record books as one of the most stressful years for superintendents around the country. We've all been tested by extended periods of record temperatures and humidity, drought, excessive rains, etc. Turfgrass on our course has survived exceptionally well through the most difficult time of the season. While I'm incredibly pleased with our conditions for this time of year, we have experienced thinning and some turf loss in certain areas. 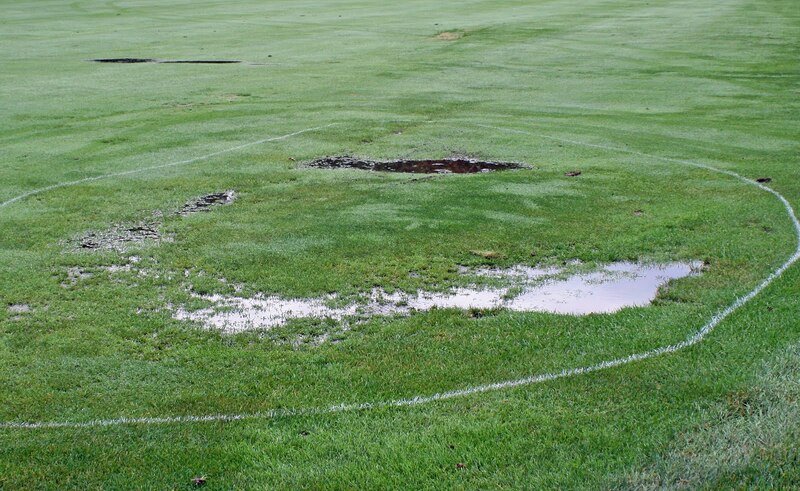 Most thinning and loss is attributable to areas where water collects and/or the soil remains saturated for long periods of time. Even in areas where drainage has been enhanced over my 25+ years, we still have issues because the soil is a heavy clay. The best example being #10 fairway. 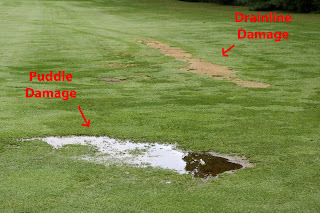 We have turf loss in areas that consistently puddle yet are within feet of drain lines. The water does not move easily to drain lines because of the heavy clay soil. Those same drain lines lose turf because the sand based soil above them wilts much quicker. We can not use automatic irrigation to give the drain lines sufficient moisture because adjacent depressions would be constantly puddled. In years past we would hand water the drain lines to combat the problem. Hand watering fairway drain lines is very labor intensive and quite frankly, budget restraints have limited our ability to do some of the little things we'd done in previous seasons. While #10 fairway is an the extreme example, in an extreme year, it is the only fairway that has been an major issue. I consider #18 approach to be a close second, but that area is affected more by non-existent drainage. The damage on #10 fairway must be considered as acceptable because the labor costs of repeatedly hand watering fairway drain lines would far exceed the cost of overseeding. 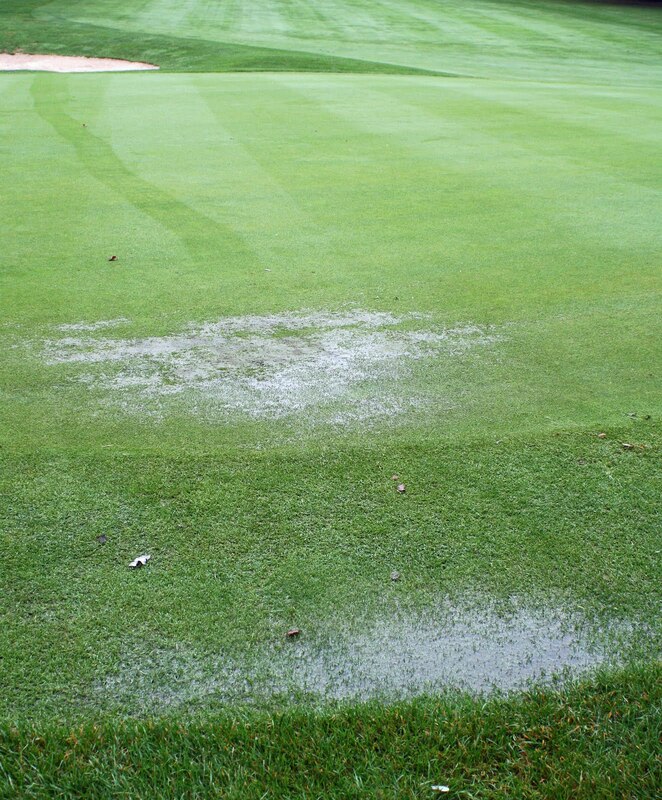 Some of our greens, like #'s 12 and 13, remain puddled and saturated during extended periods of heavy rains which causes thinning. The near four inches of rain since Sunday has not helped the cause this week. The photos below were taken this morning to help you visualize the conditions we are seeing in the above mentioned areas. The weather will finally be turning the corner in the next couple of weeks allowing us to overseed the effected areas and begin the road to recovery. Here is the link to Director, David A. Oatis's August eleventh USGA Northeast Regional Update. Summer is far from over at The Farms CC but we're still hanging tough! Word Spreading Fast! See What Dr Kaminski Has To Say! Couldn't help but post this too! Looks like some of my fellow bloggers have picked up on this article from The Wall Street Journal. 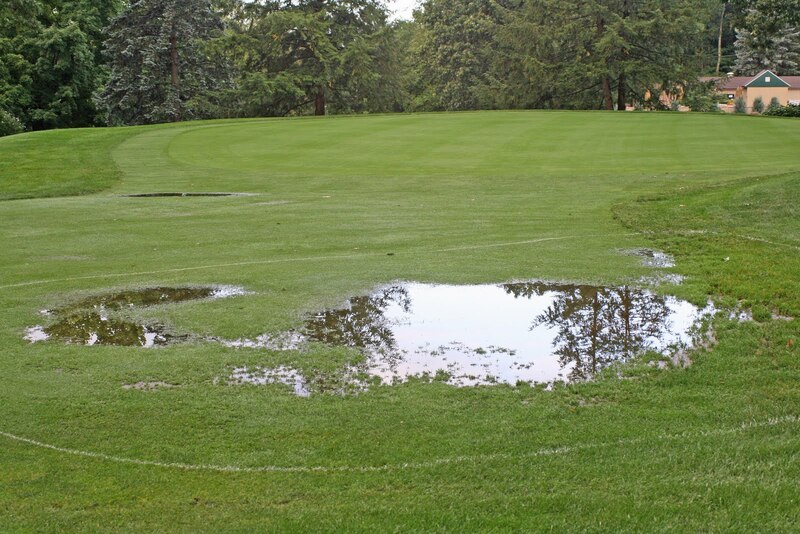 We have seen some pretty tough weather conditions for golf courses across the country. No surprise if you've been following my blog. A break in the golf calendar today is providing the perfect opportunity to finish the needle tining we started last week. We are also hydrojecting some greens. 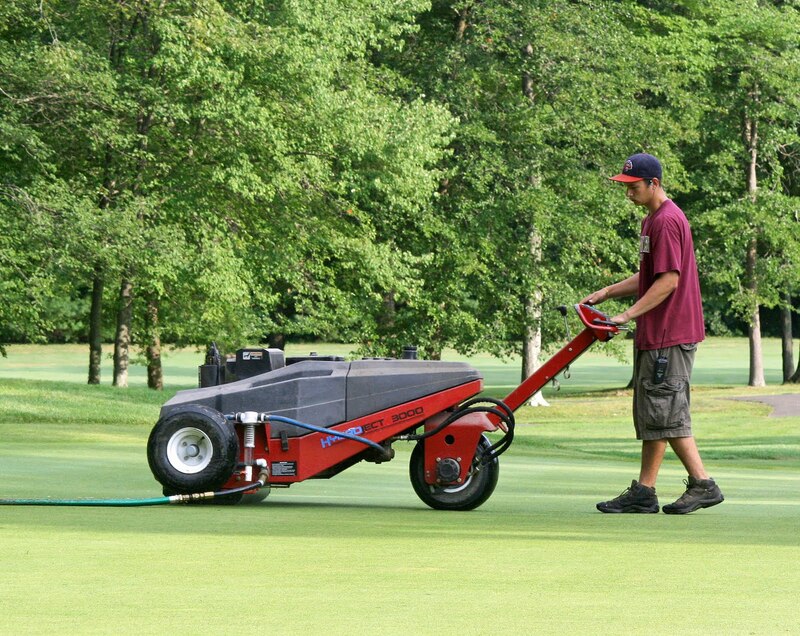 The Hydroject is a water injection aerification machine. This machine injects water, at high pressure, to an average depth of five inches. It creates minimal surface disruption. The hole is about the same size as a coat hanger. By tomorrow, golfers will not even know we were there. While needle tining vents the turf to help with gaseous exchange in the soil profile, hydrojecting helps relieve compaction during the season without sacrificing playing conditions for extended periods of time. These two cultural practices are critical to our ability to help turfgrass survive the stressful summer between our scheduled, more invasive, core aerifications.